Mobile Data Computers (MDCs) have become a fast-growing trend among public safety agencies, and have been used in a variety of vehicles including police cars, fire engines, search and rescue vehicles, and ambulances. With its integrated system providing mapping, routing, image viewing, two-way messaging, and vehicle locating capabilities, GST Mapper® MDC equips your agency with first-hand information and unparalleled support. 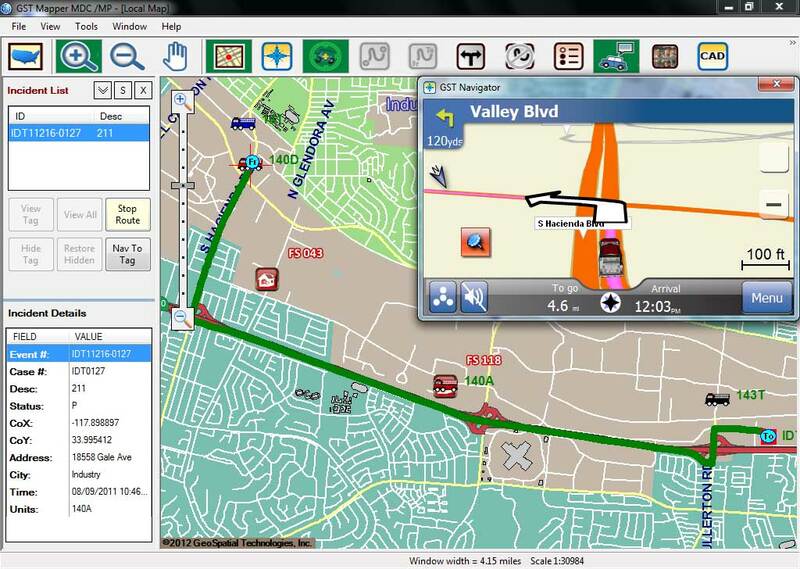 GST Mapper® MDC offers a complete set of user-friendly mapping functions to assist field officers identify map features and search for locations, such as street labeling, map scale control, address finding, aerial photography, image display, and others. GST Mapper® MDC also supports ruggedized laptops in the toughest operational environment with touch screen and regular mouse options for convenient operations. The shortest route between the vehicle's current position and the incident location where the unit is responding to is highlighted on the map. 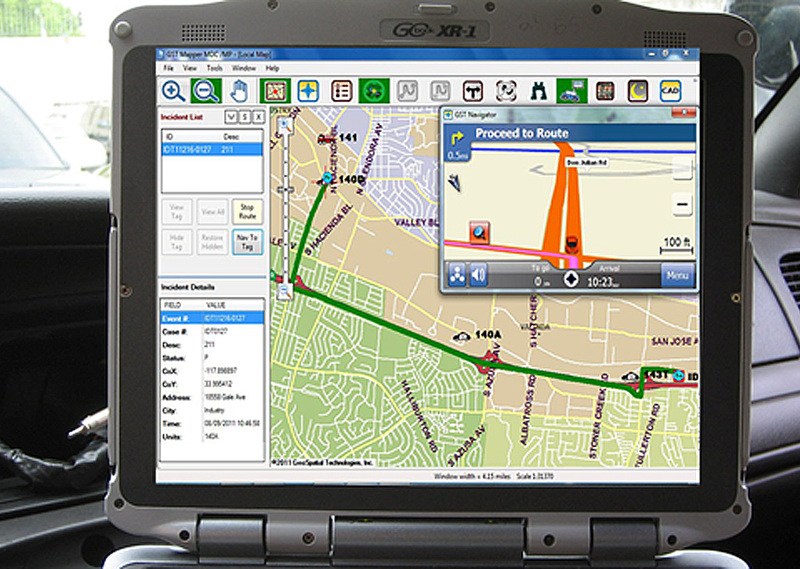 The user may click a button to retrieve turn-by-turn directions of the route. The route is dynamically re-calculated in response to either a change of vehicle position or reassignment of incident when the dispatcher assigns the unit to a different incident. The system is fully automated without the need for field officers to click any button. GST Mapper® displays the current position of the unit and centers the map at the position if so requested. 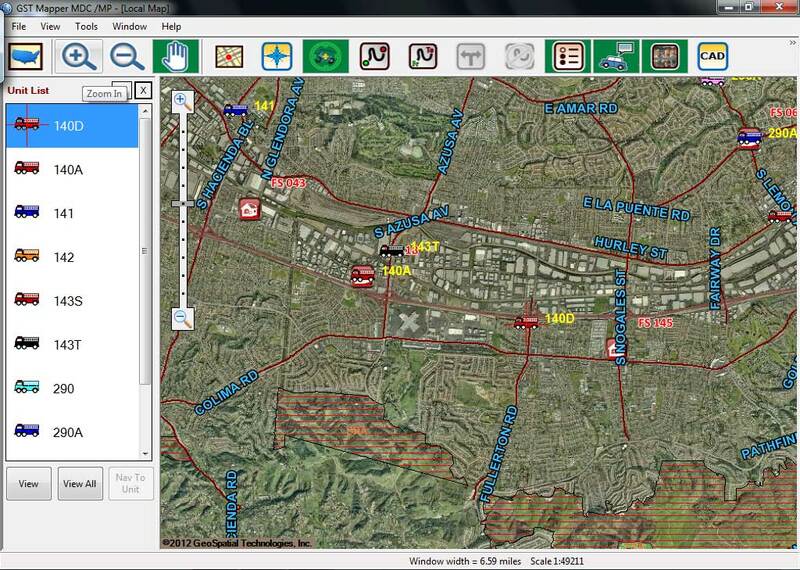 The system provides an option to display aerial photography as the background, or switch back and forth between aerial photo and other map layers. Pictures, building floor plans, or any other scanned images of common image formats such as BMP, PNG, JPG, TIFF, and GIF, can be registered to map locations and displayed whenever the user clicks on the corresponding locations. Change the color of the map layers as well as black background so it's easier for the eyes at night. Generate a report of detailed driving history of any selected unit for any specific time period. This report may contain all the polling points and the corresponding events. With proper wireless communications, GST Mapper® MDC enables the authorized user to watch current positions of other units. Utilizes agency provided GIS map data as well as providing the ability to toggle to a national map view using Microsoft’s national MapPoint map. Agencies who do not have their own GIS map data may select this module to display CAD incident and AVL data on Microsoft MapPoint map. Provides an OEM or consumer like heads up navigation display, which offers turn by turn verbal and displayed directions, points of interest and saved locations. Agencies that choose to integrate with CAD enable the ability to navigate to a dispatched incident.